Beeches favour free draining soils such as chalk, limestone, or light loams, which is why they have grown naturally in England below the line that stretches from the Wash to the Severn. This also predisposes the trees to grow on banks or ramparts. In her analysis of the tapestry trees, ancient tree specialist Jill Butler has written that ‘the buds on the trees vary, differentiating at least oak and ash trees, the compartmentalisation of the trunks seems to be emphasised by the coloured stripes and even the hollowing of the trunks has been captured.’ As far as I am aware no one has yet identified any of the trees on the tapestry as beeches. This article attempts to identify a number of beech trees in the tapestry, which might lend support for Simon Coleman’s site at Beech Farm as the proposed battlefield site. I will also discuss the last scene of the tapestry in relation to Malfosse. In Montfaucon’s drawing the English soldiers are walking on a downward slope, and the Norman knights seem to be galloping downhill – the hooves of the horses are lost to the border. However Benoit is known to have compressed some of the images when trying to standardise the size of the panels. Yet whether or not the above image is meant to suggest a downward course for the Norrmans, the raised height upon which the English foot soldiers are placed would naturally lead into a scene of descent into Malfosse. Many left their corpses in the depths of the forest, and others were found by their pursuers lying by the roadside. Although ignorant of the countryside the Normans eagerly carried on the pursuit, and striking the rebels in the back brought a happy end to this famous victory. Many fallen to the ground were trampled to death under the hooves of runaway horses. The term ‘forest’ had a very clear meaning in medieval times. It was a place set-aside for the king’s pleasure to hunt beasts of the chase. A forest could cover many thousands of acres of land, as for example at Ashdown. Although people could live and work within forests, they were subject to strict, often brutal Forest Laws, which were in place to preserve the chase. The Forest Laws also generated a valuable source of revenue for the Crown. A Forest would comprise a range of habitats such as woodpasture, heaths and open spaces often called lawns, as well as traditional enclosed woodlands. Beasts of the chase included not only deer, but also hares and rabbits, as well as wild fowl and game birds. Rabbit or ‘coney’ warrens were often a feature in Forests. Introduced into this country by the Normans, rabbit meat and fur were valuable products. A royal hunting ground had to be maintained, and couldn’t be made solely of impenetrable thicket. The ideal hunting ground was wooded, with open areas and clear paths that allowed for a variety of cover for different types of game. Poiters specifically mentions ‘the depths of the forest’ and ‘trackless country’. He was likely referring to a managed forest (Weald), and, as the quotation by Bannister above clearly states, part of forest management included the pollarding of trees. Beeches were pollarded at head height to ensure the growth of the tree out of animal reach, to maximise firewood, and preserve the tree into the future. The last tree of the tapestry looks very much like a pollard beech, with either symbolic beech nuts at the ends of its boughs, or points where it has been pollarded. Beech woods were an important resource that belonged to the Anglo-Saxons[v], and the presence of a beech tree towards the end of the battle could be read as a symbol of conquering the enemy and taking ownership of the land. Bannister’s suggestion that the Wealden wood was characterised by large areas of wood-pasture rather than dense and impenetrable thicket fits well with the information we have regarding the last chase of the battle. If we believe that the Malfosse scene is represented by the ‘hillock’ scene in the tapestry – a point that has been much disputed – and that the Malfosse scene took place in the forest mentioned by William of Poitiers, then wood-pasture as the dominant forest environment, rather than dense woodland, would make more sense as soldiers could have travelled through it to reach the ravine. The hillock scene (below right) shows wavy lines suggestive of a stream. The horses are either falling from a height, or having jumped have pecked on landing and gone head over heels (as horses sometimes do when jumping huge fences in races at speed). There is no higher ground visible in the preceding scene of the tapestry to set up this downward motion of the horses. As Simon Coleman has commented in his case for Beech Farm, ‘this could well be the deep valley, or ditch, of Malfosse, but the slope or bank on the other side of it has not been included.’ It would thus make more sense if the falling (or Malfosse) scene came after the final scene, as I have set out below. Here I have placed together the two scenes in question. I have kept the rear end of the black horse in place in order to show the ditch or stream beneath. I would argue that it makes more sense for horses galloping on a significant downward slope in the left scene to end up in the positions in the right scene, than it does for horses to end up in those positions after galloping on the more gently sloping battlefield (the terrain that the hillock scene immediately follows in the accepted sequence of events). The horses to the right of the upended black horse appear to be stumbling on uneven ground, or even raised tree roots, which could be suggested by the wavy brown line. One explanation for the apparent absence of a downward slope before the stream is that it comprised one of the end scenes of the tapestry that have now been lost, and that at some point in time the Malfosse scenes became disconnected from the end of the tapestry and rearranged into earlier scenes. Charles Stothard’s comment upon the condition of the end of the tapestry being ‘a mass of rags’ when he found it lends some support to this theory. [vi] Musset has also suggested that another one and a half metres of tapestry is missing. [vii] If the hollow beech pollard in the previous scene is signifying the entrance of the armies into beech forest, followed by a downward slope scene that is now missing, then this would provide a new clue regarding the nature of the Malfosse incident and where and when it took place. The tree in the hillock scene itself (below) might also be a beech, and the clusters on its branches could be beech nuts. Above I have placed all three scenes in question together. Just to reiterate, it would seem that the scene depicting the downward descent into Malfosse is now missing, but it could have occurred after the last scene, and before the falling horses. Thus, the beech with the hollow at its centre, placed on high ground, effectively begins the hillock/Malfosse scene, and the beech on the far right of the hillock itself would seem to close the action and mark the descent back onto level ground. The bark is smooth and grey. Mature Beech trees have a light wispy look to their outer twigs, while the main side branches can often be as thick as many other tree species trunks’. In autumn beech develops bristly seed pods which fall and open to reveal nut like seeds known as ‘mast’, and which are distinctively 3-sided. The opened pods often remain on the tree long after the seed has fallen. This is significant because the contemporary depiction shows what is essentially no more than a see-through hole at the top of the tree. It makes more sense to consider this circle as a filled-in space that is lighter in tone, as Stothard has it pictured above, which would more clearly suggest the interior of the tree. In addition, there seems to have been some confusion about the shape of this hollow. Ducarel’s engraving below, and the Montfaucon engraving of 1730, both depict the hollow of the beech as an elongated oval rather than the circle that it has become. This clearly shows a hill in the last scene, rather than the line of the ground coming out of the beech tree itself. Like the Montfaucon engaving of 1730, this also suggests that the beech bole was never meant to be circular. This discrepancy between oval and circle is significant because the original elongated oval resembles a single lobe of an open beech nut pod (see below centre). This shape is also evident in the earlier tapestry beech tree pictured below (right). Further depictions of beech nuts appear in the upper borders of the tapestry in the last scenes and earlier during the battle. Beech nuts also feature in the upper border of the Malfosse/hillock scene (see the falling horse pictured below). In places the nuts have been restored using reddish brown yarn. In places where they have not been restored the stitching is faded yellow, without an embroidered centre. The nuts are pictured as growing in clusters of three. As already mentioned, earlier in the tapestry a group of trees appears with twisted vine-like twigs to their upper regions. They appear specifically in relation to the start of the battle and Harold’s hiding place (below). Scene 64: On the morning of the battle William’s army gallops away to find Harold’s army. The beech trees may suggest that the Norman army knows the English are in the vicinity of Beech Farm, and/or suggests the presence of the Norman army in Harold’s homelands. Scene 68 and 69: Pictured ascending a hill, William asks Vital if Harold’s army has been seen. A look-out then warns Harold that the enemy is approaching. Harold is also pictured on high ground with beech trees behind him. As regards the so-called scales, if we are looking at a two-dimensional picture then these marks have to constitute the interior of the tree. Some pollards possess bumps or lumps where the branches have been cut (see below right), and much older pollards have much larger gnarled lumps and bumps towards their tops (see below left). Some of the Burnham Beeches reached 500 years of age. According to James Watchman Storrar, field ecologist of southern England, mature beeches – aged forty years upwards – produce the best harvests, with trees in their prime being around a century old. Storrar also states that good and bad mast years occur biennially in southern England. [xi] The presence of so many beech nuts in the tapestry clearly suggests that 1066 was a bountiful mast year. To be producing nuts, the trees surrounding the battlefield had to be well established. We don’t know exactly what the forest around Battle looked like in 1066, but it is more than possible that ancient pollard beeches were a feature of the landscape, and that they might have been especially well known in the vicinity of Beech Farm. The surrounding place names do suggest a large area of beech that included ‘Great Beech’ to ‘Little Beech’ further west, both of which appear on the OS map south west of Beech Farm, and beyond that is the wood now known as Beechdown Wood. While by today’s standards the details concerning the tapestry trees might be considered too minute to be of real significance, we need to remember that the medieval imagination was far more deeply connected to the natural environment in ways that we may no longer fully understand. Beech and its fruits were an important part of medieval life – culturally, materially, and aesthetically. The tapestry was created by English designers and embroiderers in southern England[xii] – which is, after all, the native landscape of the beech tree – who were telling the story of the loss of their homeland. [xiii] Beech was considered alongside the oak as a giant of the forest. The death of the English king in the forest landscape of his youth, and the loss of England to French invaders, was a national loss that was felt personally. The details of the trees and their fruits, and what they might tell us about the terrain of the battlefield and its environs are an integral and meaningful part of this story. [iii] Lucien Musset, The Bayeux Tapestry, 2005. [iv] Nicola Bannister, ‘The cultural heritage of woodlands in the South East With reference to the High Weald • Kent Downs • Surrey Hills Areas of Outstanding Natural Beauty’ (2007), p. 6. 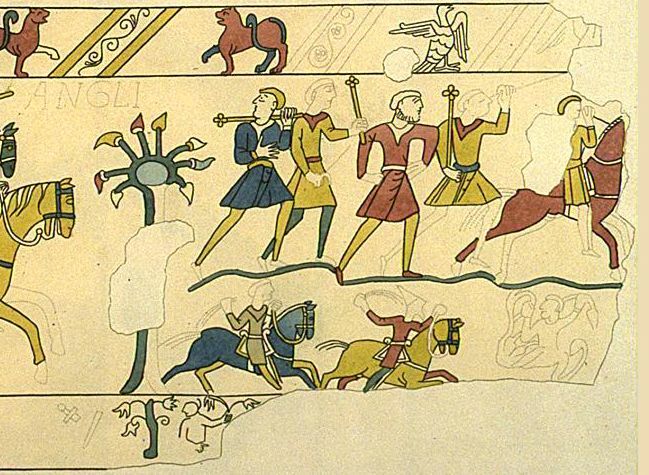 [vii] Lucien Musset, The Bayeux Tapestry (2005). [xii] David Wilson, The Bayeux Tapestry, 2004. [xiii] Simon Coleman, in email conversation, 30 September 2018. Battle of Hastings Create a free website or blog at WordPress.com.